As we understand, Select Registry announced on November 1, 2018 that your membership fees for Select Registry will automatically renew on January 1, 2019. Included in our Advantage Plan Program, we have been providing Select Registry Cost of Sales / Return on Investment Reviews, and many of you have already completed the request form to receive this service. But, we also want to let other Innkeepers that do not participate in our Advantage Plan Programs that we will also be happy to assist you on billable basis if you too would like help with this process. In an effort to be completely transparent regarding the steps we take in these reports, we have put together a 10 minute video to walk you through the process, should you like to put together your numbers on your own. Finally, many thanks to Chuck and Charlie Anderson at Lucille’s Mountain Top Inn and Spa for allowing us to use their screen snapshots for the video! 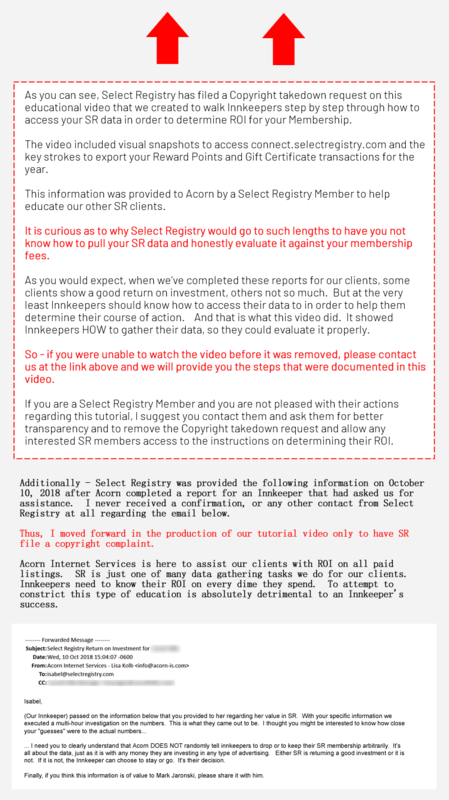 Without them, our instructional video would not have been so easy for fellow Select Registry Members to follow and use. Thank you both! This entry was posted in ethics, select registry by admin. Bookmark the permalink.